This story certainly was bittersweet. It was a story about the people, this island, and their hopes and dreams. But first, this is book 3 and at first I felt, well not lost, but I did feel like I if I had gone into a room filled with people who knew each other. And I dared not approach anyone cos they all seemed to enjoy each other's company so much. But I got to know them by watching them, it that makes sense. The book is mostly about Flora, a former lawyer, who now runs the Seaside Kitchen. She loves this windswept island and its people. And her big farming family. I do not know the story of her and Joel. But I guess they worked together, became a couple and now live on Mure. But not together. And she is preggers, and he has some horrible past that makes him scared of loving anyone. So she takes small steps and this could break him. Which is so sad, because she needs some support too. But he does seem really messed up. There is her brother Fintan, and hos husband Coltan who is dying. I guess if I had seen them meet and fall in love then this would have been so sad.It still was sad, but yes it would have been so much more heartbreaking then. Then there is Saif, a doctor from Syria who was reunited with his boys, but his wife is still missing (and yeah, after this book I doubt she is alive.) But he mourns and feels like maybe they still live somewhere where there are more like them. Lorna, the teacher who is in love with Saif, but she also knows he still loves his wife. Poor Lorna. Poor Saif. And then there Christmas approaching. A person in itself. And the light it brings this island. And I mean literally cos yes I know the darkness of December. You get up it is dark, you get home it is dark. Some romance, friendship, heartache and longing. A sweet and sad Christmas tale. And the stories are not over. It's a time for getting cozy in front of whiskey barrel wood fires, and enjoying a dram and a treacle pudding with the people you love-unless, of course, you've accidentally gotten pregnant by your ex-boss, and don't know how to tell him. 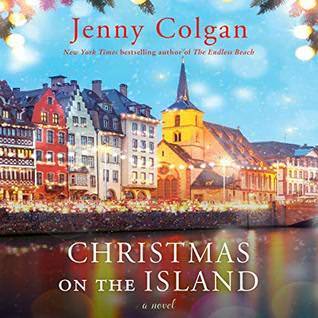 In the season for peace and good cheer, will Flora find the nerve to reveal the truth to her nearest and dearest? Will her erstwhile co-parent Joel think she's the bearer of glad tidings-or is this Christmas going to be as bleak as the Highlands in midwinter? Travel to the beautiful northern edge of the world and join the welcoming community of Mure for a Highland Christmas you'll never forget! I guess it's time to start reading those Christmas books. Sounds sweet. I like books like that this time of year. It's not my kind of book but glad to hear you liked it. Ooh, a book that feels like people watching, I actually like the sound of that. This might be a good option when the overly sugary holiday books (which I do love) start to be too much. I have read the first two books and can't wait to read this! I do enjoy sweet and sad and this sounds like a good series. It sounds like this might be a series best read in order. I am curious about everything going on with these characters. I think reading all three books and getting the background on each character enriches this one. I loved the narrator too and happy to hear you did too.